Grew Up… as an orphan. After their parents died of Dragon Pox when they were young, Tina and her sister Queenie grew up taking care of each other. Perhaps that’s why Tina became very determined and protective. Later, she attended Ilvermorny School of Witchcraft and Wizardry and was sorted into Thunderbird house. Living… in a cramped but very cozy apartment in New York City with Queenie. 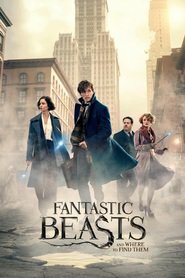 Their peaceful life is disturbed when a strange man named Newt Scamander comes to New York, loses a bunch of magical creatures, and breaks the major rule of America’s magical community: no interaction with the No-Maj (non-magical people). In her words: “Mr. Scamander, do you know anything about the wizarding community in America? We don’t let things loose.” Now, Tina is determined to fix the chaos that Newt and his magical creatures have set upon New York. Profession… former auror for the Magical Congress for the United States of America (MACUSA). After she used magic to assault a No-Maj, Tina was disgraced and stripped of her auror position. Now, she works an incredibly menial job as a Federal Wand Permit Officer, a position she detests. Interests… dueling, cooking with Queenie, and reading. Tina is a very skilled duelist but rarely gets to put her skills to good use now that she has lost her job as an auror. Relationships… single. Although she’s very down-to-earth, Tina can’t help but be slightly (just a liiittle, mind you) attracted to Newt, a man whose love for magical creatures is practically infectious. What can a girl do when a strange but charming man comes and turns her world upside down? Challenge… redeeming her reputation and getting her old job back. Tina always itches to do good for the world, and she wants MACUSA to give her a second chance to prove her worth. But with the tense political climate, the criminal Gellert Grindelwald on the loose, and the unpredictable and potentially dangerous situation with Newt and his creatures, Tina has a lot on her plate. Personality… practical, determined, and courageous. Her grounded and practical personality may make her seem staid and unadventurous on the surface, but Tina also has a strong moral compass and is very caring. She can always be depended upon to do the right thing. Tina Goldstein's popularity ranking on CharacTour is #1208 out of 5,000+ characters. See our top-ranked characters and read their profiles.